Welcome To My Gebirgsjager Backpack Changes Page Three. An idea for my Gebirgsjager figures came to me after watching the film Where Eagles Dare, where as shown on the right they used some white backpacks to carry their equipment. So I got to wondering if I could use some White artist's acrylic paint to re-colour the Dragon Wilhelm Engels original green backpack colour. Because in real life I could not see these being made exclusively in a white material. So they would have had to have been possibly white washed to change the colour, so that they could be used in alpine environment. I found two methods on the OneSixth UK forum about re-colouring materials, one was done by jbcat - Blanco and the other was by Old Git - Shoe Cream. So I have followed their ideas to change the colour of my backpack. I have already carried out two sets of alterations to the other backpacks I have here, so with the last one I have I decided to see if I could change the colour of it instead. 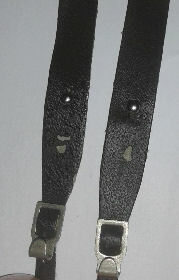 I am going to change the straps to the one's in Method 2, which have the buckles in the bottom corners. 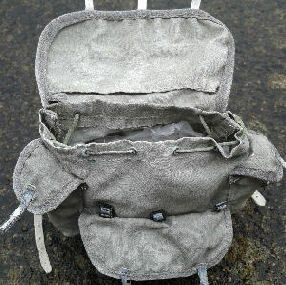 But instead of adding a pair of secondary straps to the backpack, I am just using the pair of straps already on the backpack, to connect to the new buckles on the bottom corners. 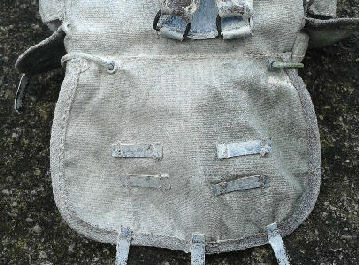 Picture 1. below is of the straps as they come fitted to the backpack, with these I am not altering them all I will do is I will remove the metal hooks. 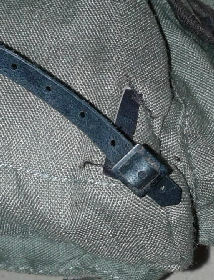 So that the strap ends can be fitted into the buckle on each of the bottom corners of the backpack, as shown in Picture 2. 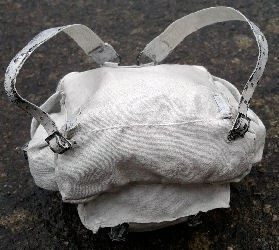 My first attempt is a major experiment by me, as I did not have any Tarrago shoe cream and at the possible risk of ruining a perfectly good backpack. I decided to try use some White fabric shoe dye on it, the pictures below show how I have progressed with this method. 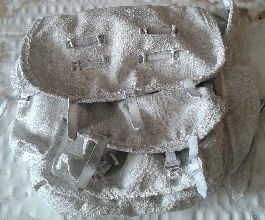 Picture 3. is the fabric shoe dye I used, Picture 4. is the original backpack before I have tried to re-colour it. 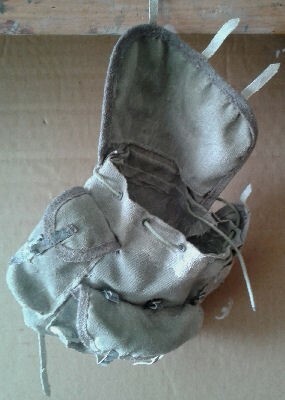 Picture 5. is after an application of the shoe dye on the pack to see how it is absorbed by the material. The picture on the right is the first coat, after I have covered the whole pack with the white shoe dye, which has also involved using a hard paintbrush to scrub the dye into the pack. I have had to let it dry for a few hours as is a bit patchy, so I will have to add a second coat of the shoe dye to re-colour the brown edges of the flaps. As well as to try to get a complete overall white colour. I left the backpack to dry overnight after applying the shoe dye a third time, I realised that the dye is too thin so I have had to re-apply some more of the dye. 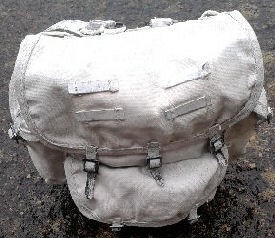 I tried again and I left the backpack to dry overnight for a second time, and I found that the end result is very similar to the picture on the right. And that instead of a White colour that I wanted, I have ended up with a sort of washed out Grey instead. Pictures 6. & 7. show the backpack where I have taken the photos outside. To show the Grey look it has instead of the White colour that I thought it had when it was indoors, as shown in the picture above right. My second attempt to re-colour the backpack and to try to get a better effect and coverage for the White colour, I bought some of the Tarrago shoe cream I also found on their website that they also have a colour chart. The picture on the right again with the photo taken outside, this shows where I have used the shoe cream on the left. 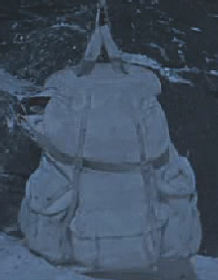 Compared to the original shoe dye colour on the right half of the backpack flap. To show a better picture of the colour differences, I have added the Pictures 8. 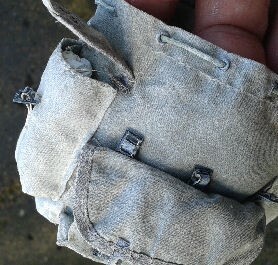 & 9. below, where I have re-painted one of the side pockets on the backpack. And even I was surprised at the how much brighter the Tarrago shoe cream is. 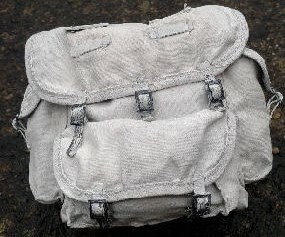 To cover the backpack with the cream, I have used a stiff paintbrush to paint it on and rub it into the material. And to try to get an even coverage of the cream, I have painted the front and one side. 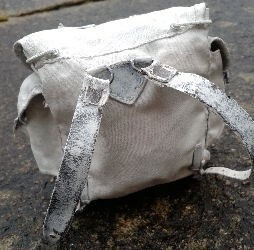 I then left it aside to dry to get an idea of how the White colour has covered the backpack. Note: I washed my hands and the paintbrush in water, and I found that the cream is water based, which helped to clean everything easier. After leaving the backpack for about 3 hours to dry, I then painted the back and the other side. Below are pictures I have again taken outside to get a better idea of how the cream has been absorbed into the backpack, and I have found that even after giving the backpack two coats of the shoe cream. That there are still some small Grey patches that need to be covered again. I have put Picture 10. as a comparison to show what the White colour shoe dye looks like, and the results that I got with it. And in Pictures 11. to 15. the results by using the Tarrago shoe cream with a much better and more even colour. I found that the material had stiffened slightly, but not as bad as I have had when I have painted some material with acrylic paint. 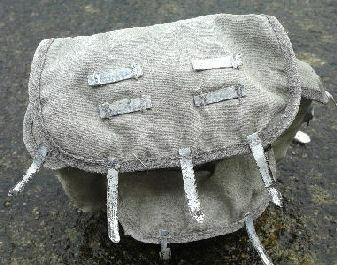 So I scrunched up the backpack in my hands, to loosen up the stiffness of the material. By doing this I found that some of the shoe cream needed to be repainted slightly, so I used it to touch up these Grey spots. The pleather straps had some of the original White shoe dye paint on them, from where I had tried to re-colour them before. I decided not to repaint them as I had intended to do, instead I sanded the straps slightly to represent wear on them, where they would be put through the buckles. 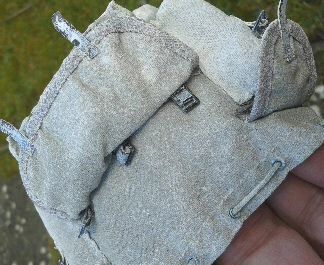 As well as wear on the main straps in Picture 15. which would be done when it was being handled. 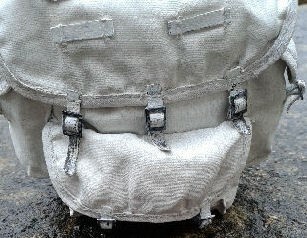 As I am thinking that with a white washed backpack like this, the first part to show signs of wear would be the straps. The second part would be the buckles, and for these I scratched each of them with my fingernails to remove the shoe cream and shoe dye. 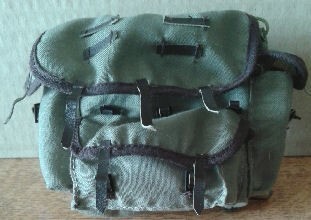 Many thanks to Heeresbergf�hrer for the pictures and the detailed help with my rucksack changes. And thanks to both jbcat and Old Git for their ideas with the shoe cream.